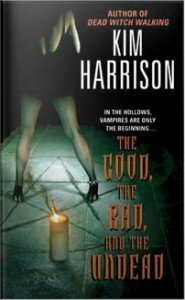 Finished reading The Good, the Bad, and the Undead (The Hollows, Book 2) by Kim Harrison. The Good, the Bad, and the Undead picks up were Dead Witch Walking left off. Rachel Morgan, former bounty hunter, has it pretty good. She left the corrupt Inderland Runner Service and started her own independent service. She’s survived werewolves, shape-changing demons, and sharing a church with her vampire roommate, Ivy. But, Rachel’s new found demon mark leaves her open to vampires pull. Rachel must confront the vampire master in order to save herself and the dark secrets she’s hidden even from herself. This book was a good follow up to the first book. Interested to see what Harrison does with the rest of the series.